Need value and performance in a desktop model? 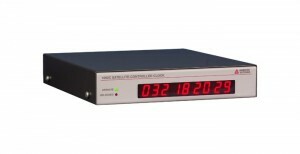 This precision time clock model brings economy and flexibility to environments that don’t need or use a rack mount system. With two terminal strip outputs providing unmodulated IRIG-B and 1 PPS signals, the 1092A/B/C is capable of driving multiple loads in parallel. Like other Arbiter clock models, various options are available to extend the functionality of the base model. Features supported include a second RS-232 port, an Out-of-Lock Relay Form C SPDT, an IRIG-B Modulated Output, and the reconfiguring of 1 PPS and IRIG-B Output to Programmable Pulse. The 1PPS Output may also be reconfigured to be an Event Input. Adding value, each Model 1092A/B/C includes a Limited Lifetime Warranty to the original owner/purchaser, a wall mount power supply, a GPS Antenna with a 15 meter antenna cable, and an operations manual. Avoid the extra charges other company’s tack onto their clocks! Model 1092A/B/C is available with three front panel configurations. See photos and Key Features tab for more information. The GPS Data Backup Battery is included in all Model 1092s. This feature improves acquisition time by supplying constant power to the real-time clock and RAM in the GPS receiver module. Open-drain FET drivers (400 V, 220 mA, 1 W power dissipation) can also be fitted; contact factory. Size 43 mm H x 218 mm W x 257 mm deep, 1 RU with Rack Mount kit, AS0044500.